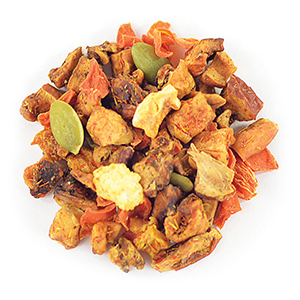 Apple bits, Pumpkin bits, Carrot bits, Pumpkin seeds, Safflowers, Natural flavors. Apple bits*, Carrot bits*, Ginger*, Pumpkin bits*, Pineapple bits*, Coriander*, Banana chips* (bananas, coconut oil, raw cane sugar), Natural flavors. * Organic. Contains: Coconut. Beetroot bits*, Apple bits*, Ginger*, Carrot bits*, Red paprika flakes*, Anise*, Orange peel*, Caraway*, Chilis*, Natural flavors*. *Organic. 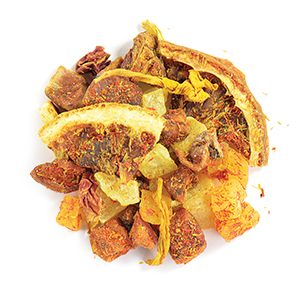 Carrot bits*, Apple bits*, Sea buckthorn peel*, Ginger*, Turmeric root*, Orange wedges*, Pumpkin bits*, Anise*, Natural flavors*. *Organic. 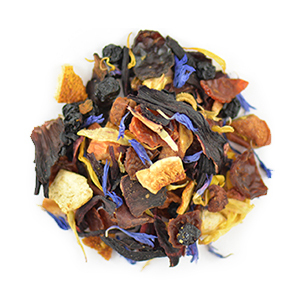 Apple pieces, Mango pieces, Elderberry pieces, Orange pieces, Rosehip, Pineapple pieces, Hibiscus petals, Natural flavors. 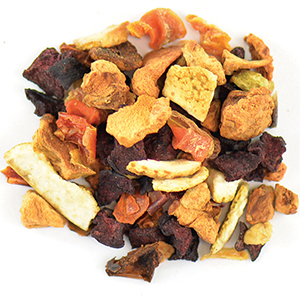 Apple bits, Dragon fruit bits, Sea buckthorn berries, Chokeberries, Goji berries, Kiwi bits, Pineapple bits (pineapple, sugar, citric acid), Papaya bits (papaya, sugar), Cranberry bits, Blueberries, Tartaric acid, Natural flavors. 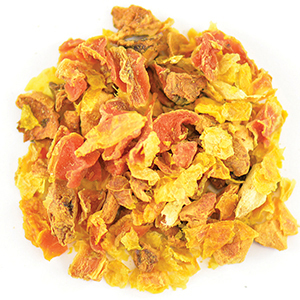 Pineapple bits (pineapple, sugar, citric acid), Apple bits, Papaya bits (papaya, sugar), Mango bits (mango, sugar, citric acid), Orange wedges, Safflowers, Rose petals, Sunflower blossom, Physalis slices, Tartaric acid, Natural flavors. Contains: Almonds. May contain other tree nuts. 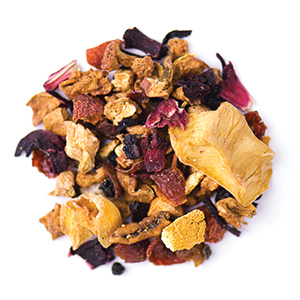 Hibiscus blossom, Apple bits, Rose hip peels, Elderberries, Orange peels, Strawberry bits, Raspberry bits, Cornflower blossoms, Marigold blossoms, Natural flavor. Contains: Almonds. May contain other tree nuts. 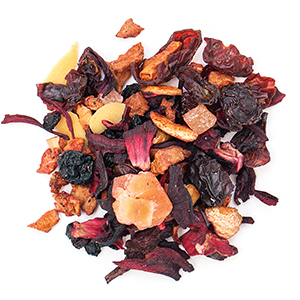 Apple*, Pineapple*, Rosehip peels*, Orange slices*, Hibiscus flowers*, Orange peels*, Natural flavors*. *Organic. 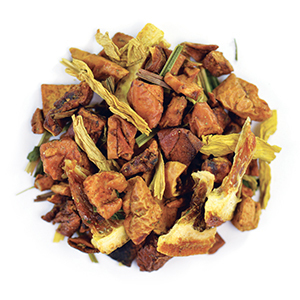 Apple bits, Orange wedges, Lemongrass, Spearmint, Sunflower blossoms, Tartaric acid, Natural flavor. 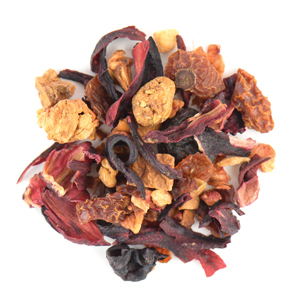 Apple bits, Hibiscus, Rose hip peel, Chokeberry pomace, Currants, Orange wedges, Sea buckthorn peel, Black currants, Marigold blossom, Natural flavors. 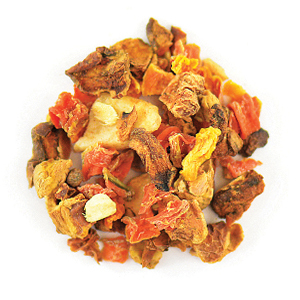 Apple pieces, Rosehip, Orange pieces, Hibiscus petals, Natural flavors. 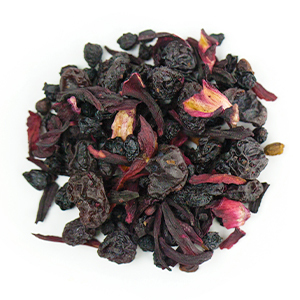 Elderberries, Currants (currants, sunflower oil), Hibiscus, Beetroot bits, Natural flavor. 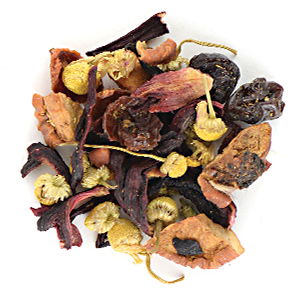 Elderberries, Currants (currants, sunflower oil), Hibiscus, Beetroot dices, Natural flavor. 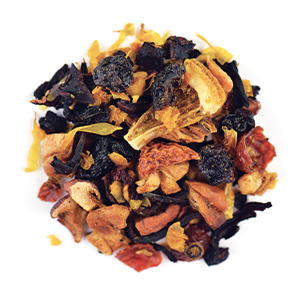 Hibiscus, Apple pieces, Rosehip, Pineapple pieces (pineapple, sugar, citric acid), Elderberries, Orange peels, Almond bits, Cinnamon pieces, Black currants, Papaya pieces (papaya, sugar), Natural flavors. Contains: Almonds. May contain other tree nuts. 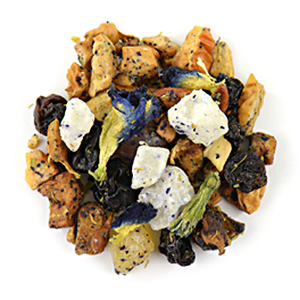 Apple pieces, Currants, Pineapple pieces (pineapple pieces, cane sugar, citric acid), Mango pieces, Papaya pieces, Butterfly blue pea flowers, Natural flavor. 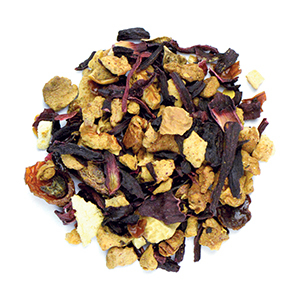 Apple*, wine berries* (wine berries*, sunflower oil*), hibiscus blossoms*, rosehip peels*, chamomile blossoms*, natural flavor. *Organic. 1. 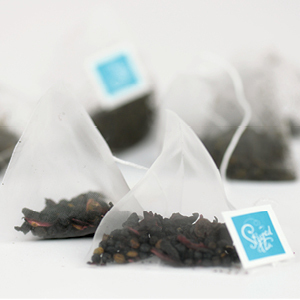 Scoop loose leaf tea into an infuser of your choice. 2. Place infuser in your cup or pot and pour hot water over tea. 3. Steep for 4-5 minutes for best flavor. For Iced Tea, pour steeped tea over ice and chill in refrigerator. Add fruit tea to your kombucha in the second fermentation. 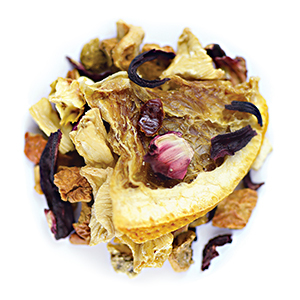 Make your fizzy kombucha with the Kombucha & Party Entertainer (9262). 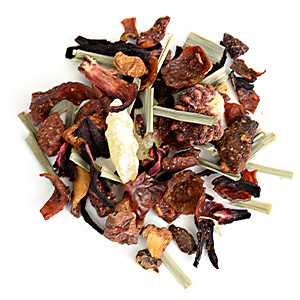 Contact your sipologist to book your next Ice Tea Tasting! Wine berries* (wine berries*, sunflower seed oil*), apple*, hibiscus blossoms*, rosehip peels*, pineapple*, strawberry*, natural flavor. *Organic. 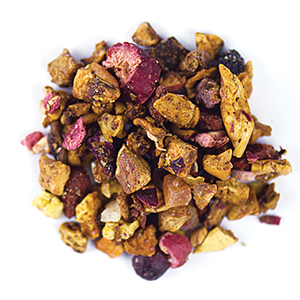 Apple pieces, Pineapple pieces (pineapple pieces, cane sugar, citric acid, Rosehip, Hibiscus petals, Lemongrass, Papaya pieces, Blackberry pieces, Banana pieces, Strawberry pieces, Cherry pieces, Orange pieces, Raspberry pieces, Natural flavors. For iced tea, pour steeped tea over ice and chill in refrigerator. Add fruit tea to your kombucha in the second fermentation. Make it Sangria in the Sweet Tea Pitcher (9140). Contact your Sipologist to book your next cocktail making tea bar! 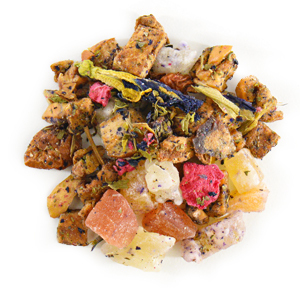 Apple pieces, Pineapple pieces (pineapple pieces, cane sugar, citric acid), Mango pieces, Papaya pieces, Butterfly blue pea flowers, Spearmint leaves, Raspberry pieces, Natural flavors. For iced tea, pour steeped tea over ice. Let chill. Place in refrigerator. 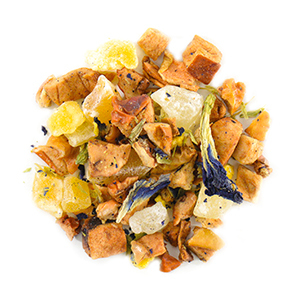 Apple pieces, Mango pieces, Pineapple pieces (pineapple pieces, cane sugar, citric acid), Butterfly blue pea flowers, Peach pieces, Natural flavor. 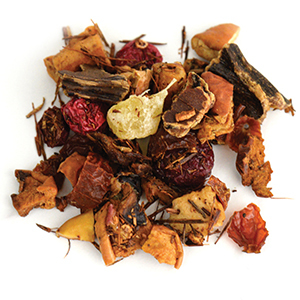 Apple pieces, carob, pineapple pieces (pineapple, sugar, citric acid), rosehip peels, rooibos, red currants, natural flavor.